Show Of Hands is a Denver art gallery featuring unique handmade wall art. The pieces we showcase in our gallery are created by artists locally in Denver and all across the USA. 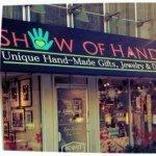 Whether you’re looking for a unique painting, statement piece, heirloom quality original, or any other kind of hanging art, look no further than the wide selection of wall art at Show Of Hands.